The damp gray skies with us since December have set records for the highest precipitation and least sunshine during the period in the city's weather history. 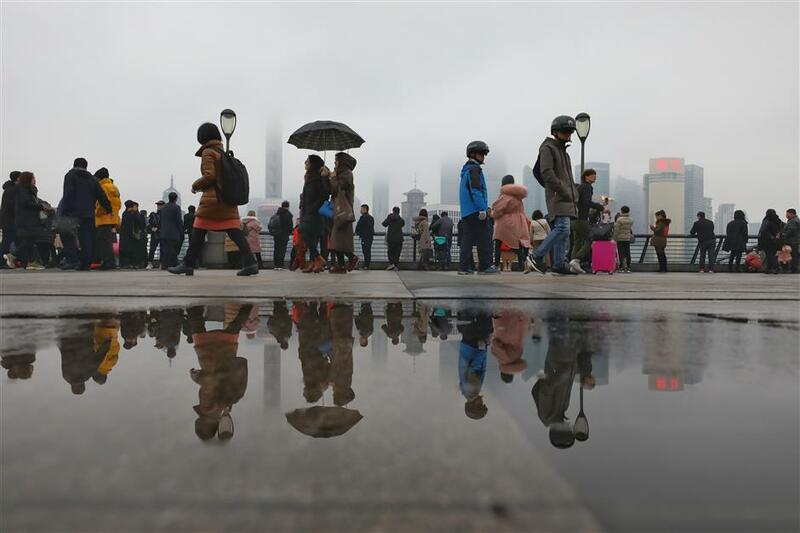 Visitors stroll along the Bund in Shanghai on January 10, 2018. The damp gray skies with us since December have set records for the highest precipitation and least sunshine during the period in the city’s weather history, local weather bureau said. The rainfall of the past 40 days in the city’s outskirts was triple the average since 1961, when suburban weather stations were built. Suburban areas got 15 more rainy days than the norm. Downtown areas also saw the most rainy days since the benchmark Xujiahui weather station was established in 1872. Sunshine was at a record low. Taking suburban Baoshan District as an example, the district has basked under the sun for less than 60 hours since December, only one third of its normal 176 hours. Sunshine in other districts ranged from 54 to 72 hours, below or approaching their lowest readings. In the past ten days, Xuhui, Qingpu, Minhang, Songjiang, Fengxian districts and the Pudong New Area almost got no sunshine, while Jiading, Boashan and Jinshan districts enjoyed sunny skies for only one to two hours. Chongming received the most, 3.4 hours. Wet conditions are expected to last for one more day before the dry, cloudy skies return on Sunday. Some people may actually see the sun on Sunday. However, rain will make its way back early next week. Drizzly weather is set to begin Monday. The mercury from today to Sunday will range from 5 to 10 degrees Celsius. Monday will be a little warmer.